Sacco and Vanzetti: Misplaced Justice? Before McCarthyism, there was the Red Scare. And just like McCarthyism, the Red Scare had all of America paranoid and on constant alert. And when paranoid, humans can be known to be over-vigilant and even irrational. One famous 1920s trial placed some of that hysteria into the American criminal justice system, and two men may have been convicted for their beliefs, instead of the crime for which they were charged. Nicola Sacco and Bartolomeo Vanzetti were Italian-born anarchists living in Red Scare America, just after the Bolshevik Revolution in Russia in 1917 that overthrew the U.S.-allied czarist government and instilled a communist regime. Communism then became seen as a real threat to the American way of life, so anything that was not seen as pro-America was seen to be “radical” and feared. Such was the case with two anarchists in Massachusetts – Sacco was a shoe-maker, Vanzetti a fishmonger. In April 1920, a shoe factory was robbed of about $15,000 in payroll cash, and a paymaster and guard were both shot and killed during the robbery. A few days later, while police were heading to a location where the alleged getaway car was found, Sacco and Vanzetti were arrested and charged with the robbery and murder, as they were two “Italian-looking” men as described by witnesses, and were carrying loaded weapons at the time of their arrest. The pair was found to have a gun that matched one carried by the murdered guard that was not found at the scene, and they had shell casings and bullets on them that were similar to those found at the crime scene. The pair also denied being anarchists, or even owning guns. After anarchist literature was also found on them, the pair was arrested and indicted for the robbery and double homicide. In 1921, the trial itself did not gain much attention – but the result sparked controversy. 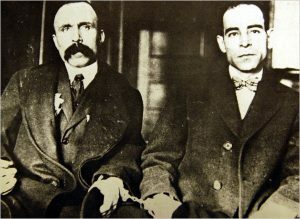 Despite Sacco and Vanzetti having no prior criminal records, conflicting ballistic and forensic reports, and several key witnesses’ credibility being questioned during the trial, and police failing to recover the stolen money, the pair was convicted of murder and sentenced to death by the judge. As details fo the trial came out in the weeks and months following, some communists and anarchists began speaking up in advocating for Sacco and Vanzetti’s innocence, and demanding their release. Noting that many witnesses were discredited, there was no money found, and there was no absolute connection between forensics and ballistics to the two men, the calls of innocence began to ring louder as the pair went through their series of appeals. Over the next five years, opposition to the conviction began to take on a life of its own, and protests and violent demonstrations were held in several major international cities lambasting the American judicial system for its unfair and unjust treatment of what was believed to be two innocent men simply because of their anarchist, anti-government beliefs. More and more people in the public became convinced that Sacco and Vanzetti were innocent, and demonstrations became more violent, including bombs being set off in New York and Philadelphia. However, despite the public outcry and several appeals, the two men were executed in the electric chair in August 1927. In the decades the followed, Massachusetts thoroughly reviewed the case and looked at how forensic investigations were conducted and aimed to improve them so that biases could be better neutralized. In 1977, the 50th anniversary of Sacco’s and Vanzetti’s executions, Massachusetts Gov. Michael Dukakis proclaimed that the pair was treated unjustly in a form of apology on behalf of the state, and urged that no “stigma” be attached to the names of the two men going forward.